SpyWall Anti-Spyware is a product of the Trlokom company working in Internet security field and developing secure software for corporate VPN, firewall and instant messaging control needs. 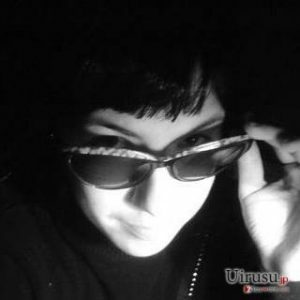 The program introduces a new way of spyware protection. It attempts to isolate the Internet Explorer web browser from other software to prevent parasites hosted on malicious web sites from infiltrating into the system. In simple phrase, SpyWall Anti-Spyware monitors Internet activity in real-time and blocks spyware downloads. Such approach is really effective, unless you favorite web browser is not Internet Explorer. The application has a trial version that expires after 14 days. It can be downloaded from the official web site www.trlokom.com. Nevertheless, it’s not an actual trial, as the program refuses to remove any malware it finds and some of its functions are disabled. Installation is basic and quick. The program is started as any other regular software, but it can also run along with Internet Explorer and can be quickly accessed from within the web browser. Once the program is running, you can start scanning your system. No initial configuration is required. 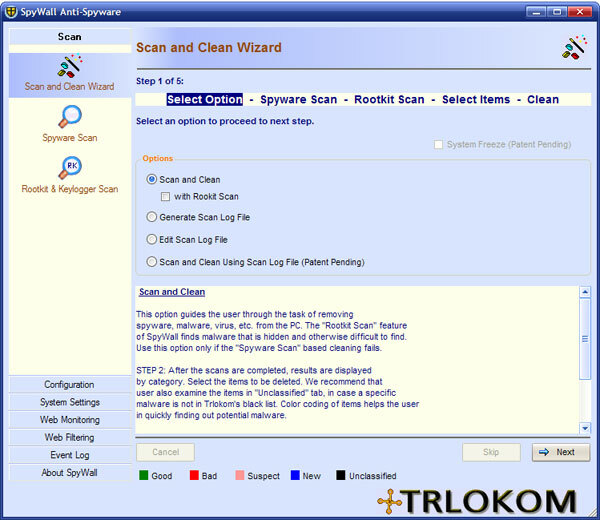 The application offers two scan modes – Spyware Scan and Rootkit & Keylogger Scan. There is also a wizard that explains each mode and helps to choose the right one. Spyware Scan is a typical scan for spyware, adware and other malicious parasites. The program checks running processes, services, loaded libraries, browser plug-ins and registry entries. It also examines files in directories where malware usually resides (system and program folders). However, the scanner doesn’t check on other drives. Although it’s a small chance of discovering malware there, you can never be sure where emerging threats may show up. Spyware Scan is really fast. It doesn’t take more than two minutes. Maybe that’s why it isn’t effective enough. We have used SpyWall Anti-Spyware to scan a badly infested machine. Scan results were not as good as expected. The program didn’t produce false positives and correctly identified most widely spread malware, but it couldn’t detect infections like Look2Me, Qoologic or numerous trojans. Some of their files appeared in the list of Unclassified items, though. However, managing items on that list requires some knowledge in order to determine which items are really bad, and which should be left intact. Rootkit & Keylogger Scan is a different mode. It searches the system for rootkits, keyloggers and their extra components. Unfortunately, Rootkit & Keylogger Scan is a paid function available only in the program’s full version. Still and all, SpyWall Anti-Spyware’s scan and removal potential is quite sufficient. The program can identify and remove typical malware that the larger part of all computers is infected with. However, if you’ve been hit with something new and sophisticated, SpyWall Anti-Spyware may disappoint you. The program implements real-time protection that prevents specific files from being downloaded, disables malicious scripts, blocks phishing attacks and keeps the user from visiting known spyware and adware web sites. SpyWall Anti-Spyware provides useful additional features. It allows monitoring web usage, running web filtering, managing program startup lists. The user can create own process, file and library rules that will be used to block specific threats. One of the weakest program sides is its interface. It is neither attractive nor convenient. Moreover, it isn’t very easy to use. SpyWall Anti-Spyware is a relatively new product (introduces in June, 2005) that isn’t as much powerful as popular spyware removers yet. Although it finds and removes known parasites, it sure has difficulties dealing with complex threats. This makes the program not ready for cleaning badly infected machines. However, the program’s real-time protection can be highly recommended for most Internet Explorer users. It’s quite simple, but it works. This entry was posted on 2014-05-07 at 21:53 and is filed under Anti-Spyware, Software.